The digital badge is an official credential that captures and validates a broad scope of learning not evidenced on a traditional academic transcript. Badges document a student’s soft skills acquired such as adaptability, engagement, critical thinking, problem solving, innovation in a student's undergraduate or graduate education. The digital badge follows the individual through college life into the first career and beyond. Digital badges symbolize the expanded curricular and co-curricular experiences and exceptional accomplishments of Walsh University students. Employers and graduate schools recognize the value of this expanded credential when affirmed by Walsh University. Who can earn a badge? Any Walsh University student can choose a digital badge to work towards earning. Digital badges provide a competitive edge in maximizing a student’s academic and career potential. The process to earn a badge is simple and the outcome will be invaluable. 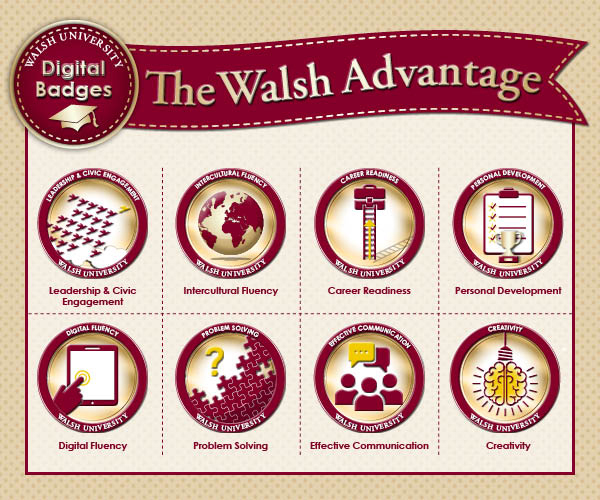 How do Walsh University students earn digital badges? Students may earn a digital badge by demonstrating a significant level of competence in a specific badge category. According to the United States Department of Education (2001), competence is a set of skills, abilities, and knowledge required to complete a task. Competence in a digital badge category may represent, but is certainly not limited to, the individual’s skill, knowledge and experience in a specific category. It is crucial that the submitted documentation or evidence clearly demonstrates competence of the digital badge. What are the steps to receive a digital badge? Complete and submit a request here. The Walsh Advantage Digital Badge team will review application submissions. Applicants will receive notification of achievement results through their Walsh University electronic mail accounts. Which social medial platforms link to the Walsh Advantage? Students can link their digital badges to Facebook, LinkedIn, Twitter, etc. Are there imposed limits on the number of Walsh University digital badges earned? There are no limits on the number of digital badges earned. Students may challenge themselves to receive multiple badges during their course of study. What office should students contact with questions? If you have any questions about digital badges, please contact the Career Readiness and Development Center located in The Marlene and Joe Toot Global Learning Center. Walsh University encourages all students to pursue a digital badge credential as an expansion of the resume and academic transcript to pursue a digital badge credential as an expansion of the resume and academic transcript to support future graduate school and career endeavors.